Our all-organic Quick Relief Spray is formulated with 9 restorative herbs for deep penetration and to give quick-acting relief. This is not your typical over-the-counter spray! It goes on cool then warms up as you rub it in. Therefore, a little goes a long way! A good herbal topical spray is worth its weight in gold. It gives immediate relief to an affected area, thereby underscoring its short-term effectiveness. When combined with a salve and/or tincture, it becomes an important part of a synergistic team of intervention over a longer term. The herbs are steeped for many weeks for optimal potency. 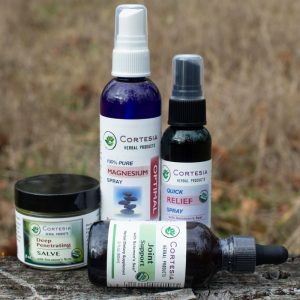 We blend herbs that give both a cooling and warming effect, and that work together for increased efficiency and penetration to deeper tissue levels, as transported by the alcohol bases. Spray onto the affected area and firmly rub into the skin. This increases sub-dermal blood circulation and transportation of herbs to deeper tissues.The alcohol will quickly evaporate, but the formulated herbs will have penetrated the dermal layers. Use before or after activity, or whenever joint stiffness is too uncomfortable. Rub more lightly for severe bruises, sprains or hurtful bursitis. Remember, a herbal spray offers short-term relief. However, as in the case of stiff joints or sore muscles, such aid may be enough to provide needed flexibility. 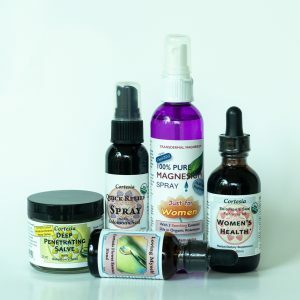 Special Note: We highly recommend using our spray along with our longer-lasting Deep Penetrating Salve and a tincture. This 3-Step Method is especially effective for providing short-term and long-term healing and relief. 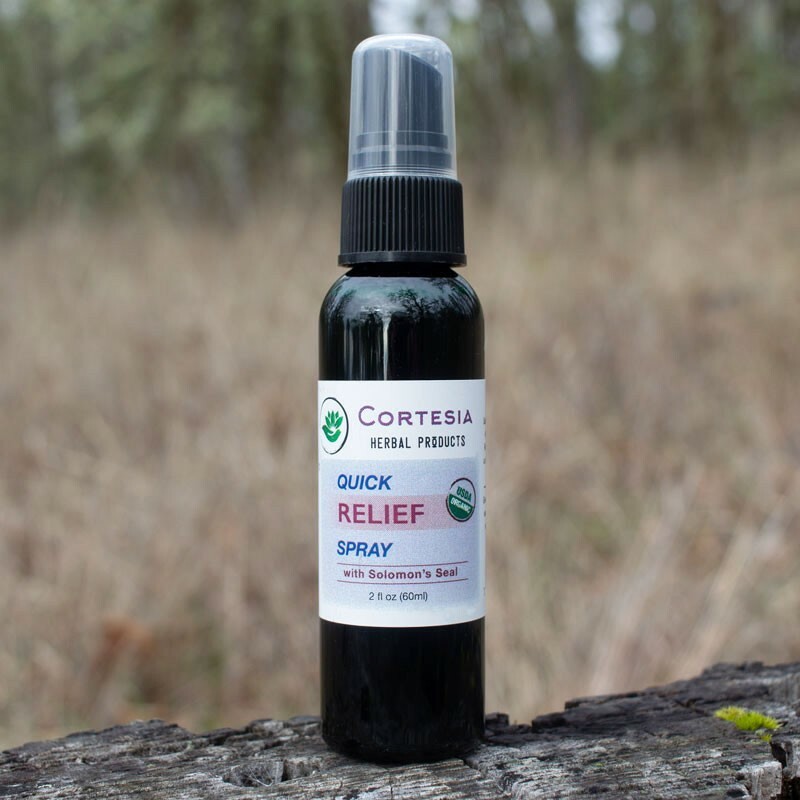 Our all-organic Quick Relief Spray is formulated with 9 restorative herbs for deep penetration and to give quick-acting relief. This is not your typical over-the-counter spray! It goes on cool then warms up as you rub it in. Spray onto the affected area and firmly rub into the skin. This increases sub-dermal blood circulation and transportation of herbs to deeper tissues.The alcohol will quickly evaporate, but the formulated herbs will have penetrated the dermal layers. 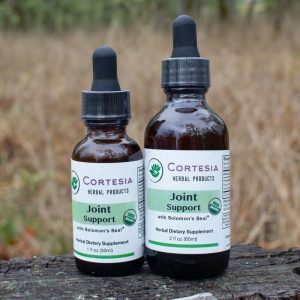 Use before or after activity, or whenever joint stiffness is too uncomfortable. Rub more lightly for severe bruises, sprains or hurtful bursitis. Remember, a herbal spray offers short-term relief. However, as in the case of stiff joints or sore muscles, such aid may be enough to provide needed flexibility. Our spray will likely provide a cooling sensation that lingers for a while. All-purpose anti-inflammatory, soothing and cooling, also anti-bacterial and anti-fungal. It is an excellent natural herbal carrier for the other herbal ingredients. Acts as a co-carrier for the other herbal constituents and rapidly evaporates from the skin after it has done its job. The 91% alcohol content insures the best extraction of the therapeutic constituents of herbs we use and the deepest possible penetration of the finished liniment. An all-purpose antiseptic and disinfectant, Isopropyl Alcohol is often used for rubdowns after physical exertion and for general massage purposes. Works to harmonize, feed, lubricate, and tighten or loosen (as needed) tendons, ligaments, muscles, attachments, and joints. It is a valuable connective tissue anti-inflammatory. As a vulnerary, it kick-starts the body’s localized natural healing processes almost immediately. Exceptional ability to heal wounds, ulcers, and fractures, and moderate pain. Aids in rapid cell regeneration and bone repair, promotes healing of damaged tendons, ligaments, and swollen or inflamed tissue. Good for soothing a sore back, aching feet, or reducing the general pain. As an anti-inflammatory and vulnerary, it is excellent for bruises, strains, skin inflammations, burns, sunburn, and external wounds that are tender, red, and swollen. Relaxes sore muscles and aids in healing the protective layer (myelin sheath) around the nerve core fibers. It is effective for general pain relief, as an anti-inflammatory, and to speed the healing of varicose veins, bruises, and burns. Helps strengthen the capillaries and has a rejuvenating and toning effect on the skin. Useful for mild muscular pain, rheumatism, circulation problems, excess cellulite, and arthritis. Contains camphor, a stimulant that increases body heat in cold, tense, and arthritic joints. Eases stiffness in the body caused by fluid retention in muscles and other soft tissues. Also combats poor circulation by increasing the blood flow around the body. Suitable for dry, mature skin. Adds a pleasing fragrance to the liniment. Among a host of uses with a long history of use, rosemary is instrumental for easing muscle pain, stimulating the circulatory and nervous systems, and promoting increased blood and lymph flow. The terpenoids in rosemary, such as rosmarinic acid, rosmanol, carnosol and ursolic acid provide effective anti-inflammatory benefits. The rosmarinic acid within rosemary also functions as a wide-ranging antioxidant and helps fight free radical damage. Helps remove congestion by dilating the blood vessels, supporting the circulatory system in more effective disposal of waste tissue and reconstruction of healthy tissue. It is an effective pain reliever and anti-inflammatory, and is useful for muscle spasms, bruises, sprains, and strains. Reduces inflammation, soothes stiffness and pain. It is considered a warming ingredient because it helps stimulate local blood circulation to bring vital energy and healing to the affected area. Cayenne is a catalyst for Comfrey, helping the skin to absorb the Comfrey. Horsetail’s high silica content helps to rebuild damaged cartilage and structures. It strengthens connective tissue, bones, cartilage, mucous membranes, arteries, skin, and other tissue. It is especially useful for misaligned joints restricted in their movement. A cooling ingredient that is refreshing, aromatic, and helps relieve muscular aches and pains. Extracted from mint, menthol is widely used in health and beauty aids.